In this issue you will find Little Village organizers, residents, and business owners talking about the challenges facing immigrants today in their neighborhood. These include the Chicago Police Department’s gang databases and the uncertain future of the Deferred Action for Childhood Arrivals, or DACA. You will also find stories celebrating the resilience and beauty of the neighborhood in the face of such challenges and the incredible strength of residents who refuse to let fear or trauma hold them back. In publishing these testaments, we have gone to great lengths to protect those sharing their stories. In our reporting, we seek to avoid the “second wound”— the harmful impact that inaccurate and careless reporting can have on immigrants. As journalists, we believe we have an obligation to protect sources and not jeopardize their psychological state or immigration status. At times in this issue, pseudonyms and illustrations are used to protect those who may be in danger of deportation but nevertheless hoped to share their experiences. We encourage others who are interested in reporting about immigrants to explore our guidelines to ethical immigration reporting at 90days90voices.com. 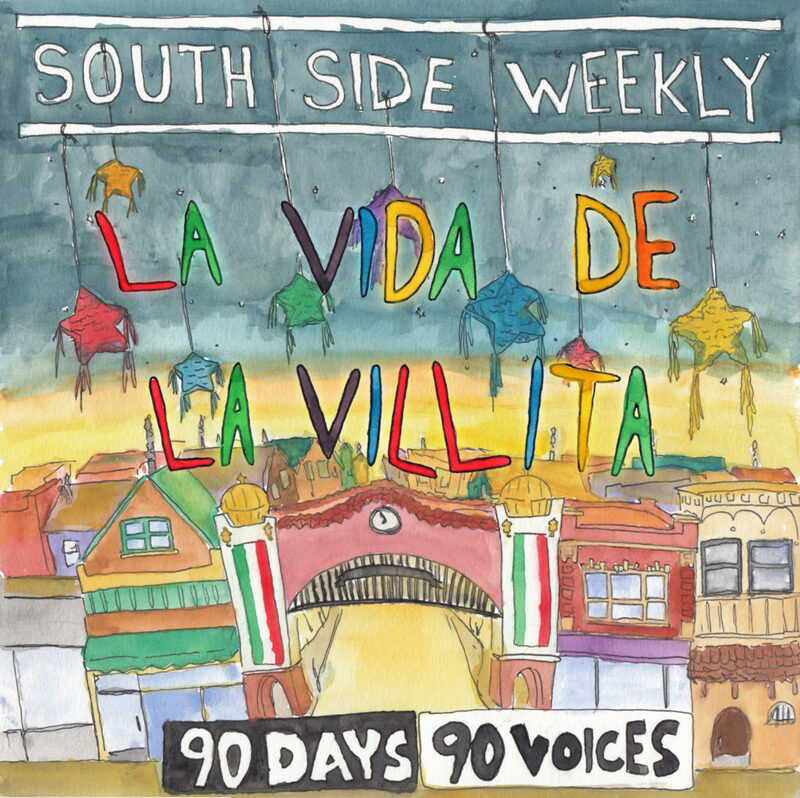 This special issue of South Side Weekly was produced by 90 Days, 90 Voices, a nonprofit organization that uplifts vulnerable voices and strengthens immigrant communities through storytelling. Our work has been featured on WTTW’s “Chicago Tonight,” in the Chicago Tribune, and on Chicago Public Radio. We are the winner of the Chicago Headline Club’s “Best Online Start-Up” award for 2017. 90 Days, 90 Voices is grateful for support from the International Women’s Media Foundation Howard G. Buffett Fund for Women Journalists as well as from individual donations. To support more journalism like this, visit 90days90voices.com. The Sweetest Day: After Trump’s inauguration in 2017, some businesses along 26th Street lost fifty percent of their sales. Inside the Gang Database: Ninety-five percent of the people listed as gang members by the police are black or Latinx. Little Village Speaks Out About the Gang Database: Residents share their stories of how the police tool is impacting their community. Join 90 Days, 90 Voices reporters, artists and contributors for a discussion on how to tell stories of immigration together on Thursday, July 26 at 6 pm at Azucar (3617 W. 27th St., Chicago). This Public Newsroom event co-hosted by City Bureau and South Side Weekly will feature the photographs of Yollocalli students and the screening of a short film. We’ll share what we learned from our six-months of reporting on immigration in Little Village and highlight some of the work included in the special issue. We’ll also discuss how others can use inclusive, non-harmful methods to report on immigration in Chicago. This fall, 90 Days, 90 Voices is launching Asylum City: a collaborative storytelling project looking at the life and death consequences of seeking sanctuary in Chicago today. And we need your help! Learn how to support the project by following 90 Days, 90 Voices on Twitter, Facebook, and Instagram. 90 Days, 90 Voices is a nonprofit organization that shares stories of immigration in this time of uncertainty. We are the winners of the 2017 Lisagor award for Best Online Start-Up.